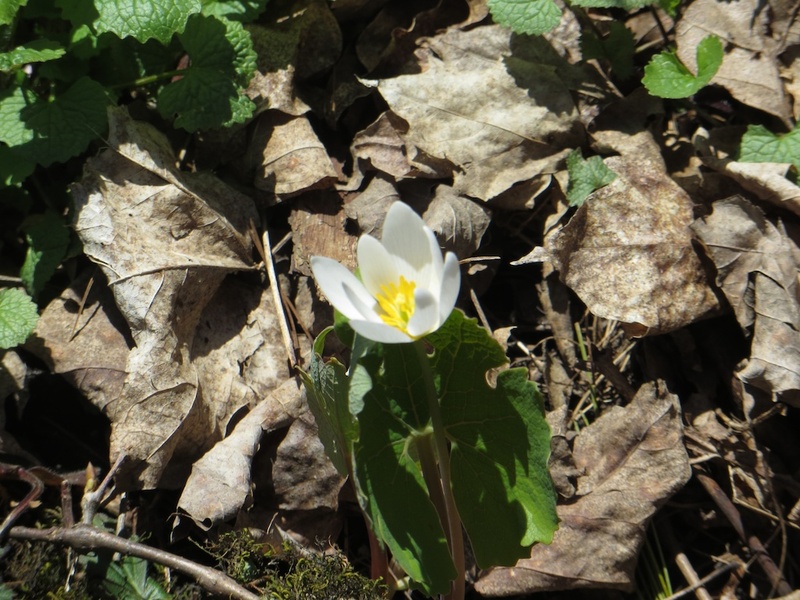 First up, Bloodroot, an early spring wildflower that grows around Hamilton. This one can be found pretty much anywhere with lots of trees and the right soil, water, and sunlight. 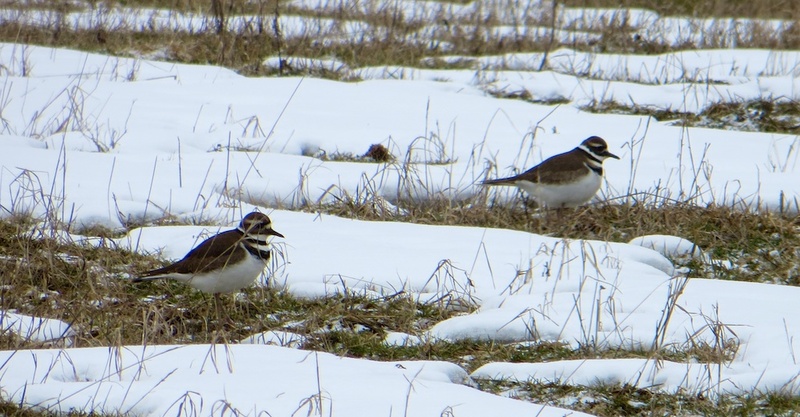 Next up, the spring bird migrations are seeing the return of a very large number of birds species that are native to the Hamilton area. 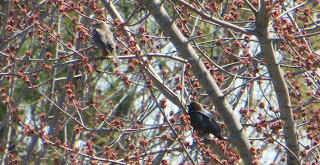 This means it's also nesting season for them, but these two (likely) mated Brown-headed Cowbirds won't need to worry about building a nest. 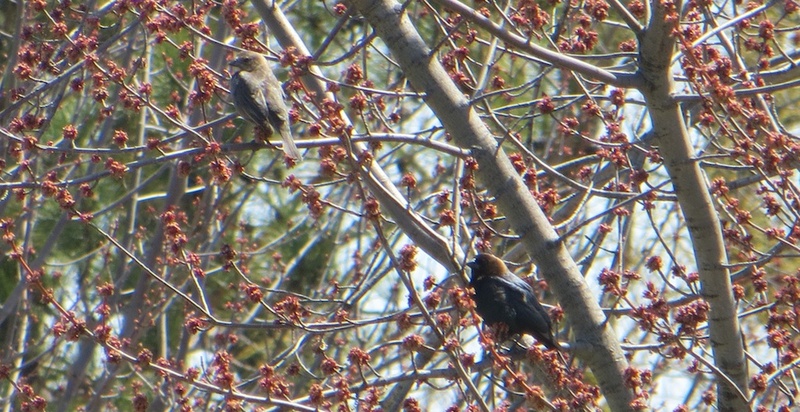 Once pregnant, the female cowbird (on upper left of this photo) lays her eggs in someone else's nest. 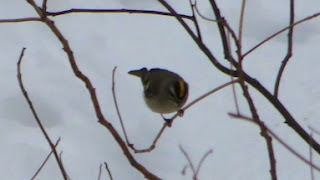 Her young will even be raised by adopted parent, even by smaller species like Chickadees. You can pick out these birds by their odd sounding calls, which sound almost artificial in nature, like the strange digital noises you can get from a damaged CD. On May 1, I took a hike down the Armstrong Trail, in the Rock Chapel Sanctuary. There I found a few of these wildflowers I had not seen elsewhere yet. 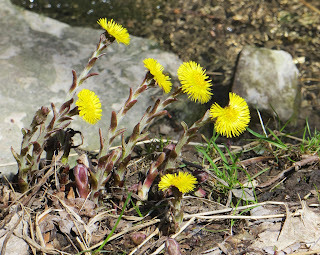 It doesn't mean they aren't all over the place, but they're the first I'd seen this year. Thanks to a nifty new wildflower identification app I got this past weekend on sale, I was able to quickly ID it as the Round-lobed Hepatica. 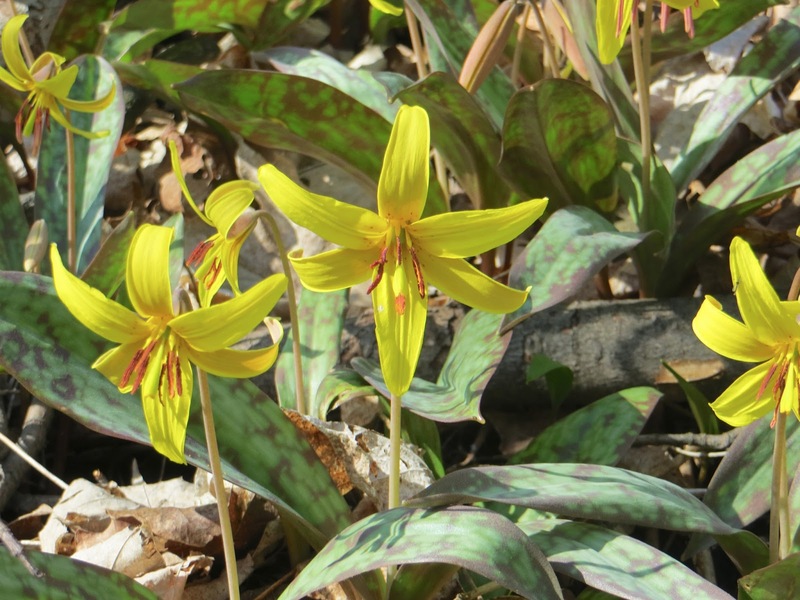 Here's a common flower you should be able to find on any hiking trail of Hamilton right now and in coming days: the Trout Lily. These flowers pop up early in the season, to take advantage of getting good sunlight before the trees block the light with their leaves. When light is dimmer, you'll see the flowers close up and hang downwards. Apparently its corm is edible raw, though I'm not taking a taste any time soon. Lastly, these birds are all over but I never seemed to get good photos of them.. until now! 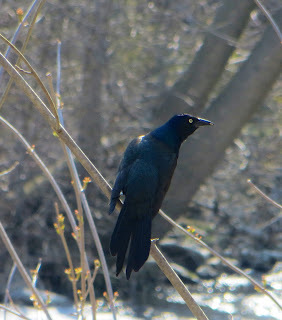 The Common Grackle is, well, common, but always seems to hide from the camera in a mess of branches or perched too far to get a good clear photograph. 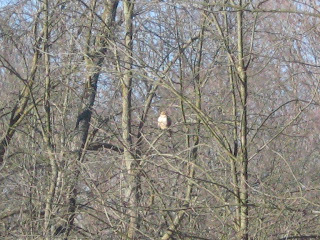 This one perched right up a few feet away whilst hiking the Optimists' Trail in Greensville. The Grackle even posed pretty well! I've finally gotten around to at least having a trail log page that lists each of the new trails I encounter in Hamilton (and elsewhere) each day of the year thus far. I'm not sure how far I can go until I run out of trails, but I think it still may be a while yet! Over the past few months I have been collecting a lot of data while out hiking. 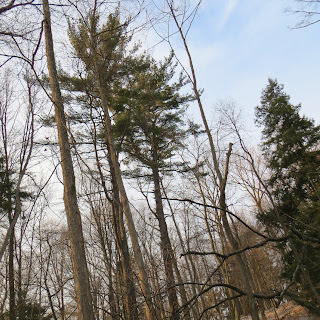 For instance, I am nearly done the mapping of Dundas Valley Conservation Area trails on Google Maps (a subject for a future, much longer blog post) and will shortly after begin adding the same data to Open Street Maps if possible. eBird is a nifty online tool developed by Cornell University's Lab of Ornithology. It's been around for the last ten years or so, but in the last five it has been especially useful as they've added public-facing data streams, and a means to store your own personal history of bird observations. It's most exciting feature, in my opinion, is the ability to create reports of bird sightings over a whole year utilizing every user's reports, plus historical data. 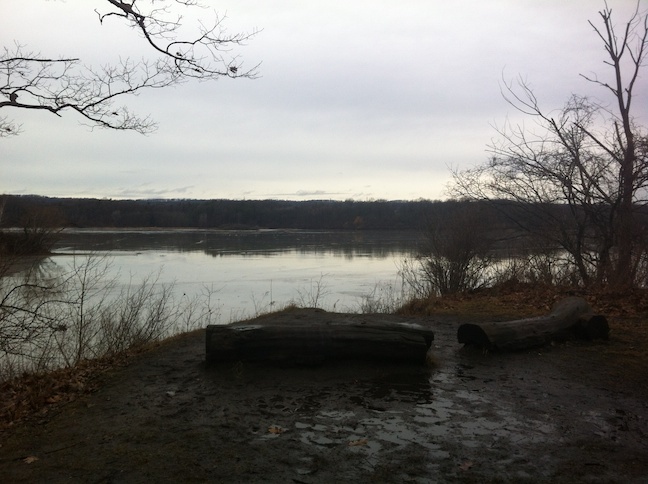 Getting a basic snapshot of Cootes Paradise, for example, is as easy as following this custom report (link) I've created that combines all the different public birding "hotspots" related to parts (or the whole) of Cootes. If you look at the link though, you'll see a few holes though: early June is lacking any data, and July and August have monthly quarters with no data. This doesn't mean no one has reported birds in those areas ever, just that when they reported, the may not have used the public "hotspots", and the data is stuck in personal location lists. 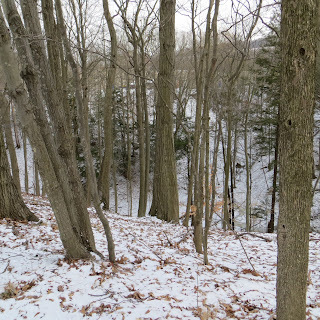 Dundas Valley, on the other hand, is much, much worse on eBird. 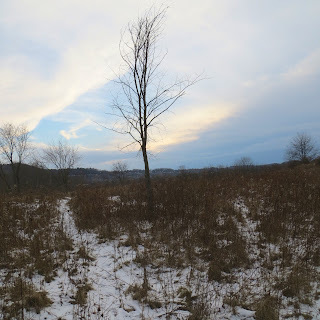 When I started becoming more active this year I noticed there was but one "hotspot", which was the whole of Dundas Valley. I've since started suggesting new sub-hotspots that eBird could add so users don't feel the need to create more personal spots, and that is likely going to help in the long run. But for now, the data is rather dismal -- except for the past few months -- have a look here at a report (link) that contains all the approved hotspots (I have two more in the queue for approval). 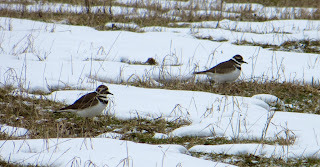 Ultimately, it'd be great to see these reports improved to the level that the general Hamilton region report (link) enjoys -- a clear snapshot of historical reports of 346 different bird species in the area, going back to 1900. 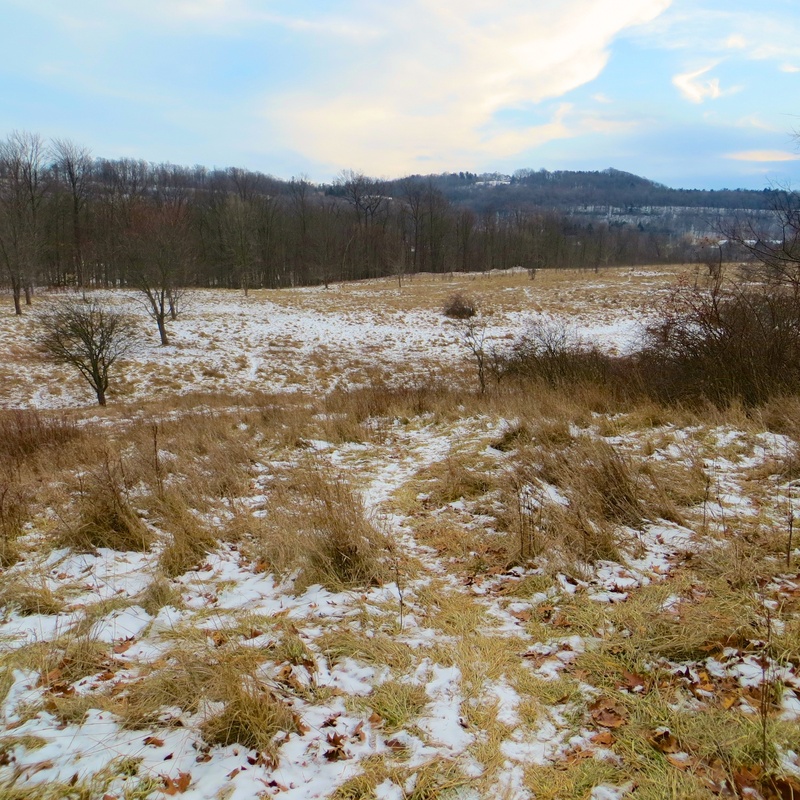 One of my goals this year will be to help eliminate these data holes for Dundas Valley (and Cootes), but one person's effort alone won't give as clear of a snapshot of species populations and presence as much as the effort of many might. Perhaps though, with the recent explosion of eBird users in the region, this problem might take care of itself this year. The most amazing thing this last few months is what little work it takes to build up a dataset. Just a few minutes here and there, and over a few months you can build a pretty hefty pile of data. And in a lot of cases you don't need to learn very many bird species to do so. 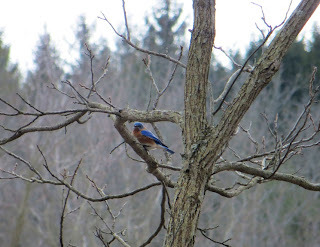 EDIT: Since this posting I've discovered a method of combining "hotspot" reports with "personal" reports in Dundas Valley -- specifically, this is possible because Dundas Valley is considered an Important Bird Area (IBA). Here's a link to the report. I still hope the Dundas Valley "hotspots" get the data holes filled this year. 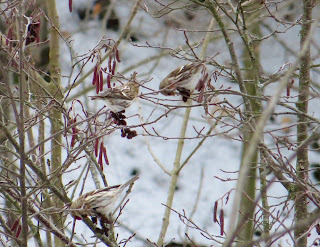 (above) Pink Siskin singing - loud but hard to find him in the spruce trees! Found just off the John White Trail. Hiding quietly within metres of a busy highway between West Hamilton and Ancaster hides one of the regions newest conservation lands. Few know of it yet, but maybe someday when its trails are finally blazed it will likely become a popular destination. 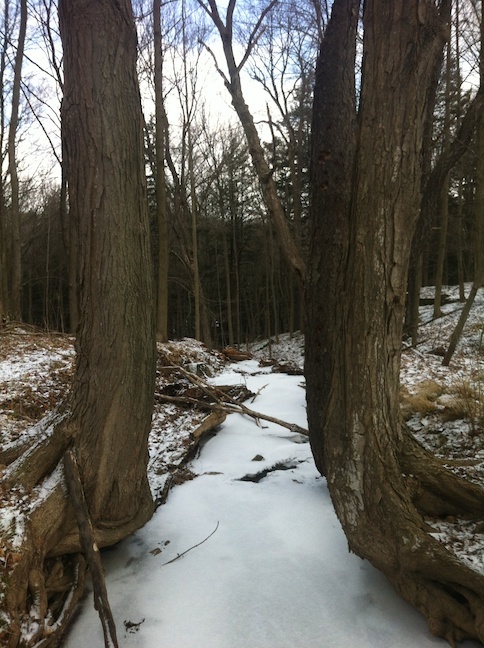 It has no official name yet, but has been referred to by many as "McMaster Forest". Oddly enough, this 115-acre "forest" seems to be more open land than woodland. It's owned by McMaster University, and until recently was under consideration for development. It appears they are opting for conservation/research uses for the land, after sitting on it since 1969. 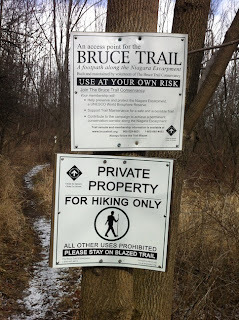 I recall hearing recently that a proper trail system may be implemented here, but I can't seem to find the reference to that online at the moment. Oh well! It was mid-February I visited this site, and I haven't gotten around to putting up a post about it until now. The views from the largest and highest clearing is pretty interesting -- there is an almost complete sensation of being inside a "bowl" of sorts, with escarpment visible on nearly every side. In the east, the south, and south-west the escarpment stretches until it is obscured by trees. 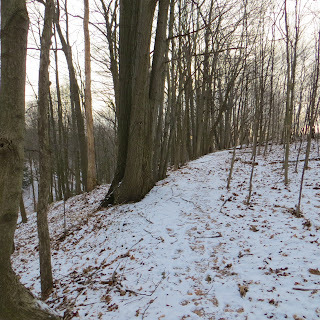 It reappears in the north-west, where Dundas Peak is almost visible, and the treeline of pines atop the "north mountain" in Dundas is visible. 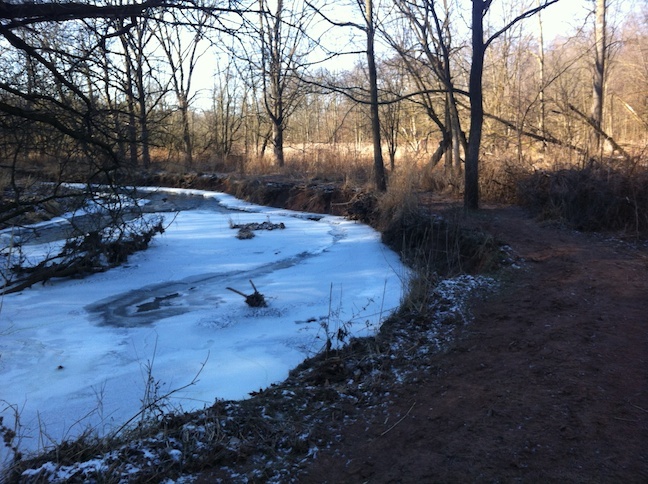 The trail system here is unmaintained. 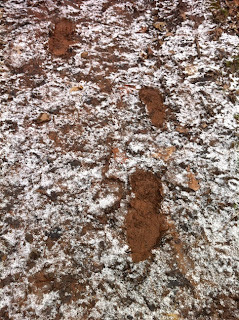 There are some clearly worn-in trails created by humans over the years, and many clearly worn-in narrow deer-trails as well. 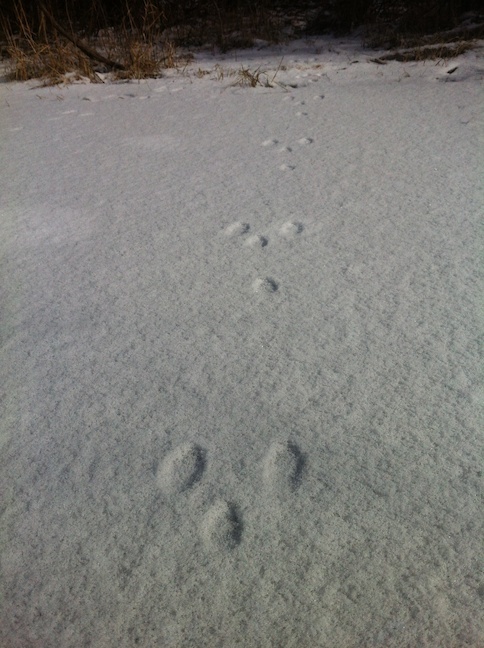 And some deer-trails that it seems quite clear some humans thought would be a good idea to follow until they lead into a nasty thornbush or very low branches. Ouch. I've only had just over an hour of time on the trails here, in the upper section (only discovering the land continued into a valley section at the end of my walk), and it's got some very nice walks. 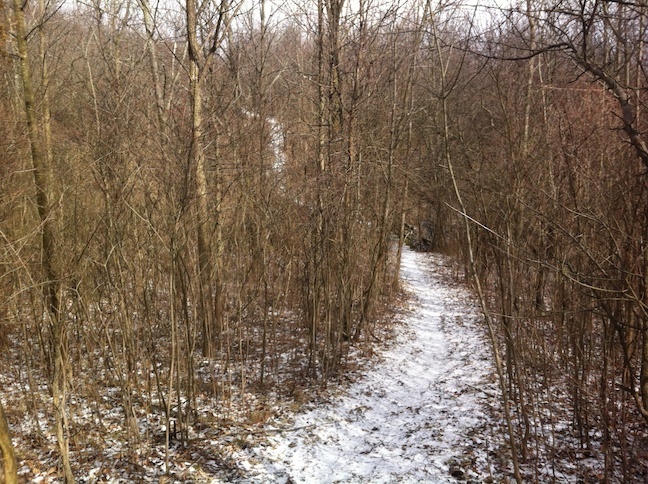 A loop trail of sorts takes you through the more open field of younger trees and bushes, leading eventually to a well-worn trail through the older growth sections along Ancaster/Coldwater Creek. That said, there are random trails all over the place, some leading to dead ends or obstacles with no clear direction whether to turn back or look for a hidden continuing trail. 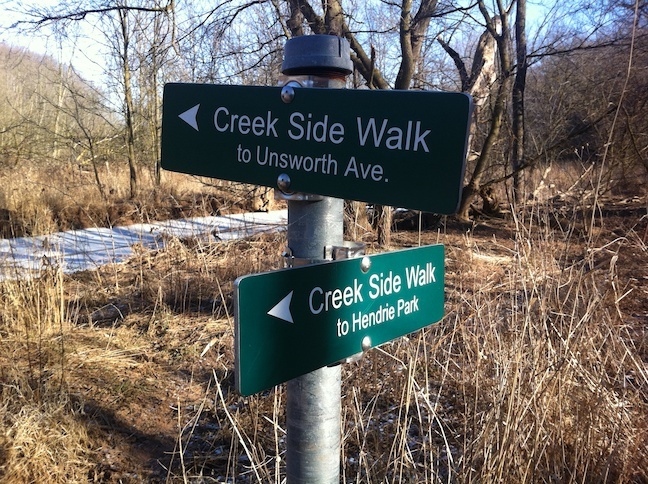 Considering that on the opposite side of the creek in the north end is Hamilton Conservation Authority land, I'm hoping there's some future collaboration between McMaster and the HCA -- It would be pretty neat if a link trail were to be created between the Monarch Trail and this new land via walking bridge over Ancaster Creek. I don't have any idea how viable that would be (or anything about the cost/impact/etc), but it's something that would be really neat, having more inter-connectedness between trail systems. But for now this remains in a public/private property limbo of sorts. It's "use at your own risk" open land, and while it is fun sometimes to hike where-ever you like instead of on designated trails, over time this place will need some proper trails before some species of plants begin to decline from being trampled on. Directions: Take Wilson Street leaving West Hamilton towards Ancaster, and turn right onto Lower Lion's Club Road. Park on the right side of the road at the fences a few metres in. Coldwater Creek. Or Ancaster Creek. Depends on who you ask. Some nice older-growth Red Pine here. Facing the escarpment in the south. One of the more established trails. 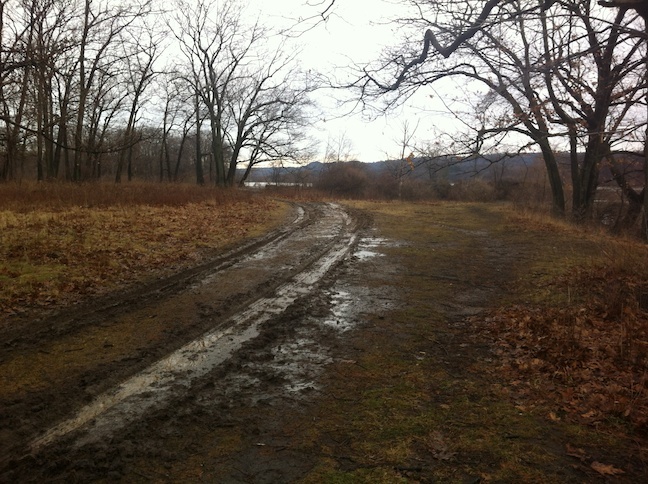 One of the less established trails. For humans, that is. 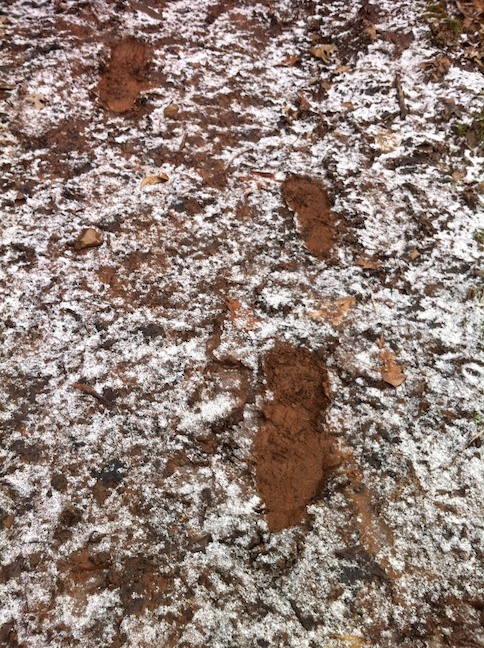 Deer trail! 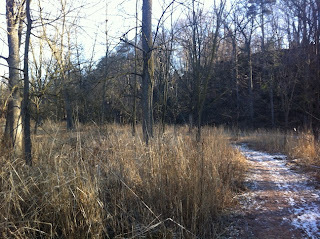 North of the village of Westdale hides numerous hiking trails within the RBG South Trails section of Cootes Paradise. Over the years of being a student at McMaster I've hiked many of them, and this year it's been fun to return and experience these trails once again. As a side note, I've decided to take a different approach now with the blog. Instead of daily hike logs, I'll be going with occasional posts with the most interesting hiking experiences. Daily was just too often (I was getting a month behind!) and this way I can focus more on the quality than the quantity. It was an early cold, wet, and icy February morning and I took aim at one of the last trails I have left in this section of Cootes for this winter. Sassfras Point Trail is a short trail that begins half-way down another trail, the Ravine Road. 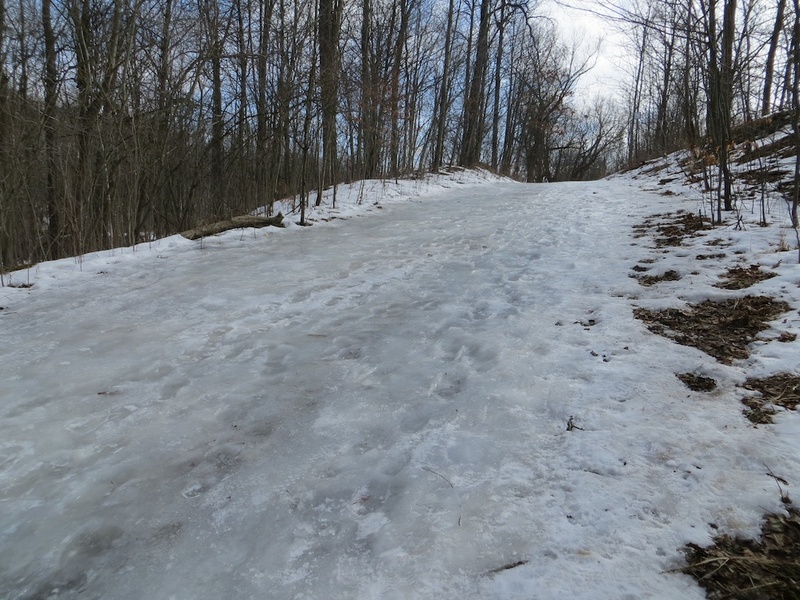 What ended up being most interesting about this trail on this day wasn't the hike itself -- it was rather rough due to the wet ice, but some wilderness encounters in the first few metres down the trail! Half-way up the first hill I spotted numerous finches -- namely some American Goldfinches, and Common Redpolls. Having recently (and finally) bought a new 20-times-optical zoom camera, I spent some time getting some decent pictures of the birds. Redpolls are winter-only birds for this region, and tend not to show up in urban and sub-urban feeders as often as goldfinches. This makes them a bit more rare, and a bit of a surprise to see so close to Westdale. 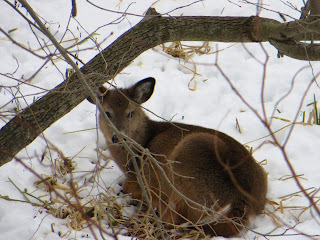 After a few minutes of photos I noticed several large dark figures in the bushes below -- some White-tailed Deer, resting! Usually in Hamilton, if you come across deer they're either grazing or running away. Just sitting there staring is a new one for me. A young White-tailed Deer, resting! 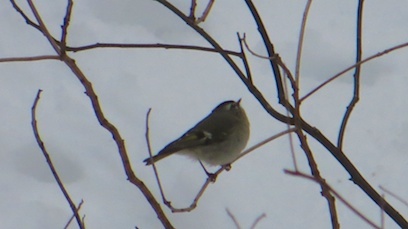 Golden-crowned Kinglet, aka "not a goldfinch"
Sadly the time spent with all these animals meant that I could not complete the whole trail on time. Having a meeting early that morning I needed to make sure my hike didn't go over a certain length of time, so I only completed about 80% of the trail. I will be back again, likely in the spring to get a good look at Sassfras Point. Having taken a couple days off and having also decided to not travel far for those couple days I came upon the idea of finding a nearby (an hour or so away) park where I could spend a couple days doing long hikes and also feel productive at the same time. 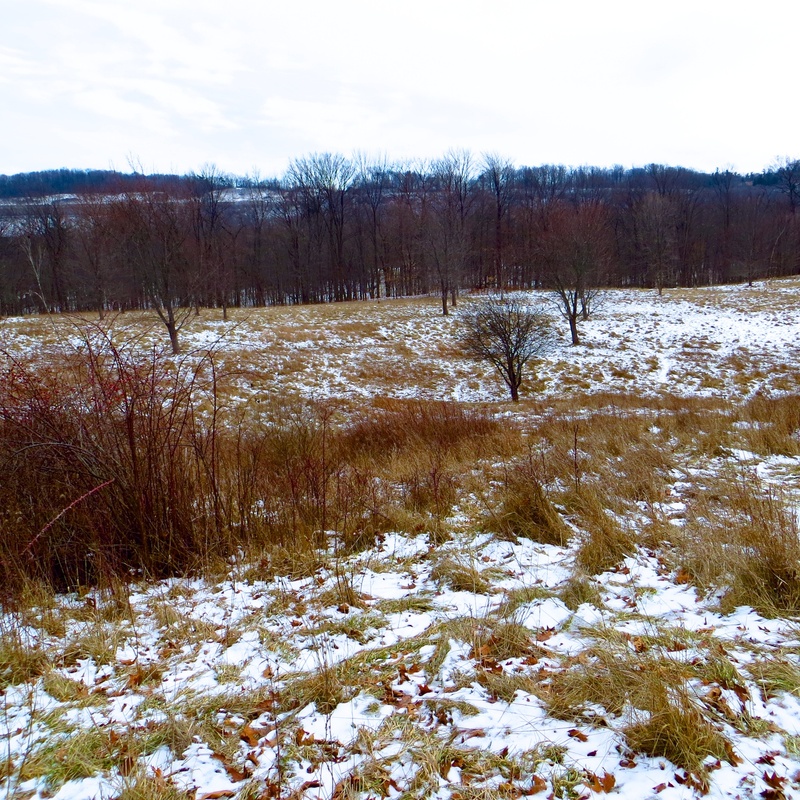 As I searched out some data about various parks in that one-hour-away-from-Hamilton zone, I came across Short Hills Provincial Park. Short Hills felt perfect -- being an hour away it was not something I'd be able to go hiking in unless I had a full day off anyways, and it's a nice big park where there are many trails, but what was most attractive was that there were two trails that required three-plus hours to fully hike. 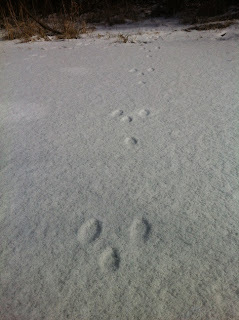 Also, these trails are not yet on Google Maps. They will be after these hikes though! Taking a look through eBird to see what to expect in March, I was surprised that such a great spot for birding was lacking in data. A quick report generated by the eBird system indicated only 22 species of bird had ever been reported as observed in the Short Hills. Surely there must be more! On day one I started with the south entrance along Roland Road. This entrance has a short (30 min) double-loop trail designed for physically challenged hikers, leading to Swayze Falls. This trail contains the only interpretive signs I saw in the entire park, which is a bit odd as this entrance seemed more like a "side" entrance to me. 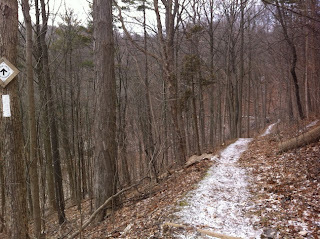 It's a nice hike though, albeit confusing due to the double-loop and overlapping with two other trails at points. 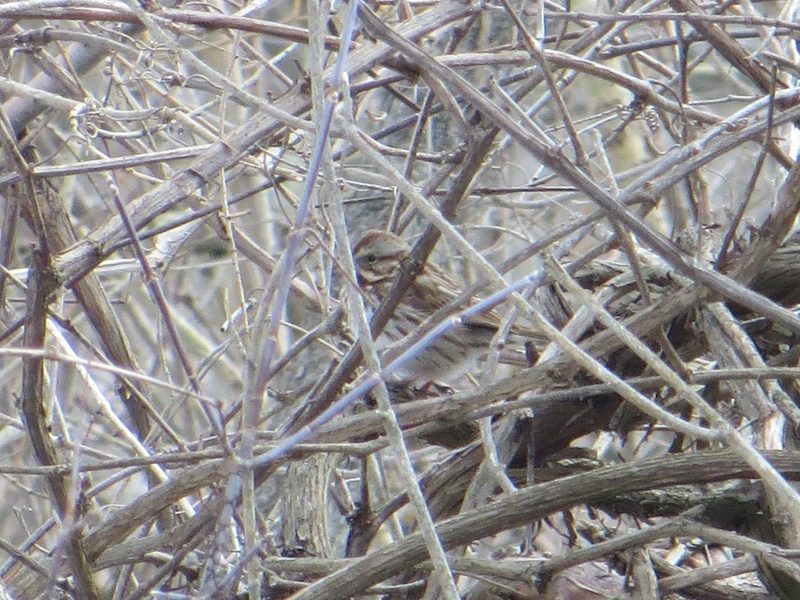 It was here that the first previously unreported species of bird was heard: a Long-eared Owl! Following the trails as far as they would go, I could not find the owl to spot it, but it was very active throughout the day as it was still hooting along later in the day just before I left. 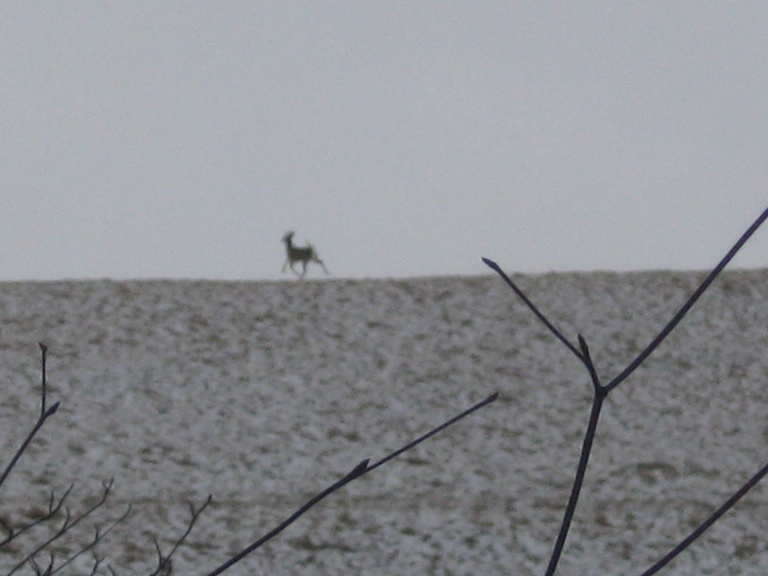 I was tempted to go off-trail and see if I could find him, and I might have done so had I not misinterpreted one of my mapping apps (I might get to blame Apple Maps for this!) for convincing me there was a road over where the owl sounds were emerging. I went back to the car, looked for the road, but did not find it. Sadly this owl was not present in the morning of day two. Oh well. This trail by-far is the longest single-hike of a loop trail I have done in quite a long while. Starting at the south entrance with the Palaeozoic Path, this trail pairs with the Bruce Trail along the border of the park for a couple kilometers, until it parts ways with the Bruce and then runs north-east towards the main north entrance, and loops back to just north of a central trail hub in the park centre, then returns, paired once again with the Bruce Trail. As far as terrain goes, this trail has everything Short Hills offers. Short, steep climbs. Open brush. Open grassy fields. 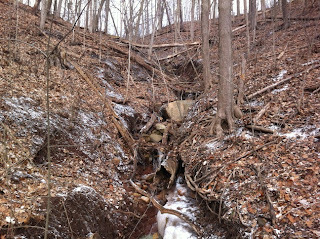 Creek valleys. Mature deciduous forest. Farm edges. 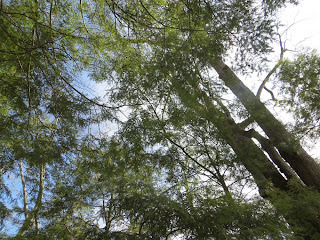 Evergreen forest. Even a cornfield! During the 3 hours hiking this trail, I only encountered one other hiker, early on. It seems not many go as far to do the whole loop. 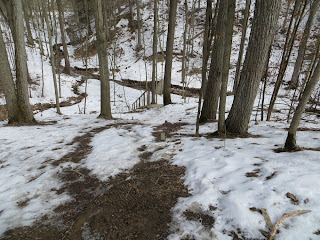 A lot of interesting problems were encountered with this trail -- sometimes it was too muddy to walk on safely, and sometimes it was too slippery with ice. Both these problems happened in the valley climbs, and whether there was mud or ice just depended on if that side of the valley had sunlight or not. A couple areas of the trail with sharp turns were missing blazes. One of them lands you in a vineyard if go the wrong way! If there are any faults with this trail, it would certainly be the lack of blazes, specifically in the non-Bruce Trail section. Before I mention the birds I saw on this day, it's worth noting that this trail features some really healthy Eastern Redcedars. Having hiked a lot of trails along the Niagara escarpment, I'm used to seeing mostly Eastern White Cedar as the ubiquitous false cedar. Early on in this hike I encountered a 2013 first -- a Northern Mockingbird. 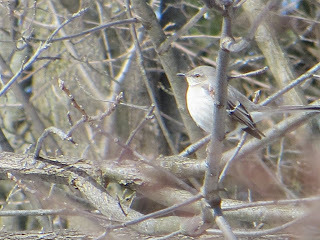 In seeing this bird I had one of those instinctual "oh, that must have been a mockingbird" followed by a second-guessing "but there's other birds that are grey, shy, and common to this region...", followed by a good photo and iBird app confirming my initial instincts. What certainly didn't help was that this bird seems to the world's most quiet mockingbird. It never sang a single note! If you've heard one before, you know they can be very obnoxious and will mimic just about any other birds' song. 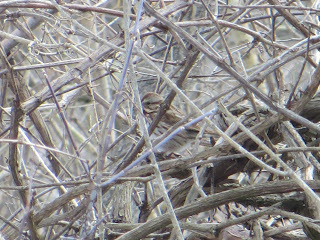 Later in the day, more unexpected bird encounters included a singing Song Sparrow, and a group of Eastern Bluebirds in the cornfield. Starting off day two, I first checked for the owl in the south entrance (no luck!) then proceeded to park at the Pelham Road entrance on the north end, and begin the loop that is the Black Walnut Trail. This trail, much like the Swayze Falls Trail has mixed terrains, but for the most part wasn't as hilly and has long sections of old roads. 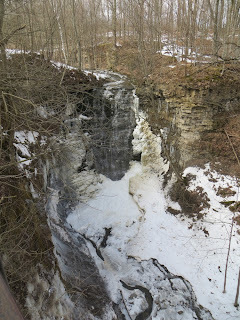 I would certainly say this trail is easier than the Swayze Falls Trail in many ways, though during icy and muddy conditions is certain not for the novice hiker. Highlights included some beaver dams in the north-west section, and the bird nesting boxes near the trail hub in the centre of the park. I was pretty lucky to get there at the right time when several bluebirds were singing and dancing. 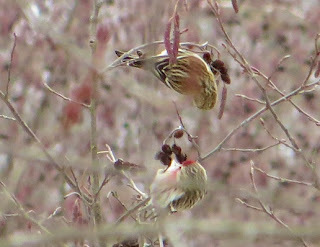 The males were doing this strange sing-while-flapping-wings dance around the females. Sometimes while standing right on top of the nesting boxes. 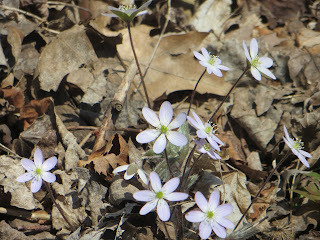 Since the Black Walnut Trail was shorter than day one's Swayze Falls Trail, I added in one more hike, and that was the western loop of the Terrace Creek Trail. 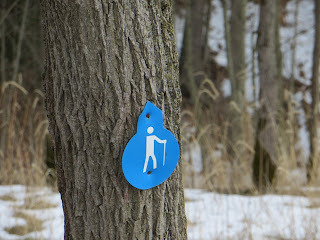 While this trail is clearly marked for hikers only (no equestrian or bikes), the north-western wing of this trail should also be marked for experienced hikers only. The trail begins innocently with a nice looking metal bridge, then leads up a hill as a v-shaped rut with running water runs right down the middle of the trail. This section should probably be closed and re-routed in my opinion, as I can't see any easy way to repair the erosive damage done to this trail. 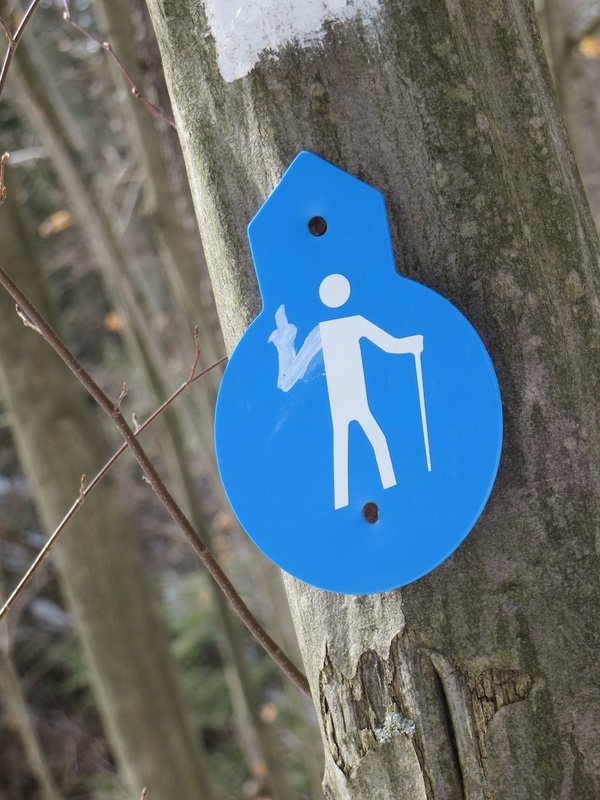 It is thankfully possible to step up to the side of the trail along an alternate path taken by smarter hikers, but even that path is not the safest of trails. Need stairs to get to the stairs! The second tough part is a large valley with a set of stairs going down to a bridge. The stairs and bridge were fine, except that getting to the stairs required walking down very steep icy trail or very steep muddy trail. Mud is easier to keep a toe-hold than ice by far, so I took that route -- that said, I'm not sure why the stairs don't go further up to avoid this problem. 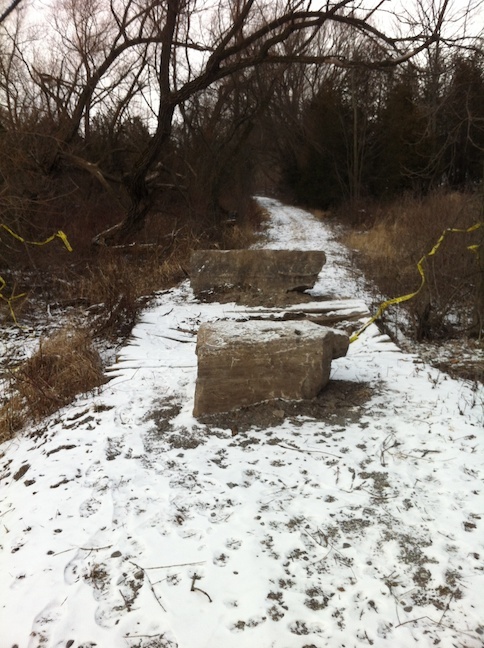 The southern leg of this trail is much, much safer. It also has a really nice short waterfall that you can get very close to the top or bottom, safely. 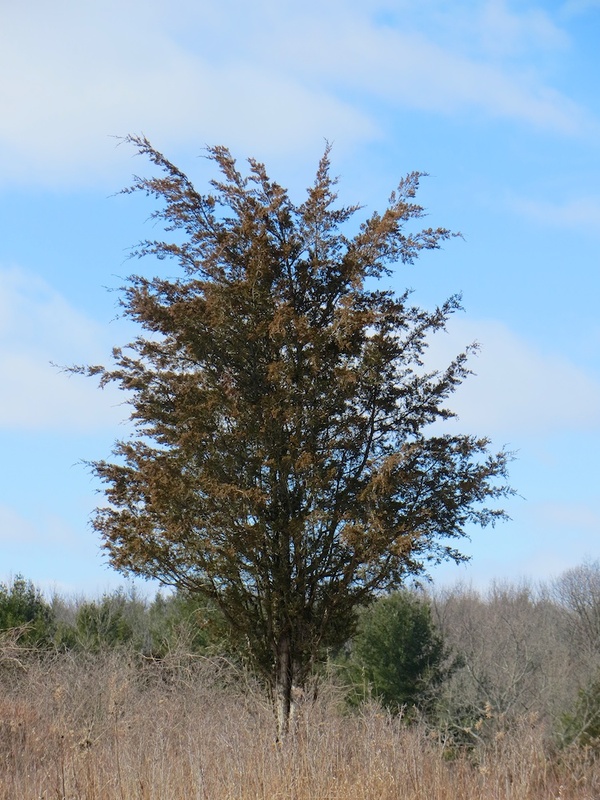 One other nice feature of the southern section is a mature stand of Eastern Hemlock. With most of Southern Ontarios forests cut down in the last 100+ years, there are few healthy stands of hemlock like this remaining. * Heard these but didn't see them. Also, both had not been reported ever in any month before... which makes it all the more annoying that I didn't see or photograph them! Conclusion: this was a pretty good idea. I think in the future I'll plan out some of my hikes based on not just adding trails to Google Maps (I'll run out some day anyways), but also to improve eBird's data for popular birding hotspots that have month-wide gaps. Or, if I want to be competitive, try to beat records and find more species in a month than have previously been reported for a location. Today's hike was a great combination of sunny and snowy. 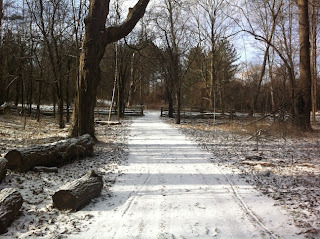 The trail was completely fresh, at around 10am I was the first person on it all day, as the light dusting of overnight snow had been undisturbed except by squirrels, rabbits, and deer. The Homestead is a great short-ish loop trail in the DVCA, especially useful for one of those times when you want to go to the DVCA but you don't have time to do the whole Main Loop. 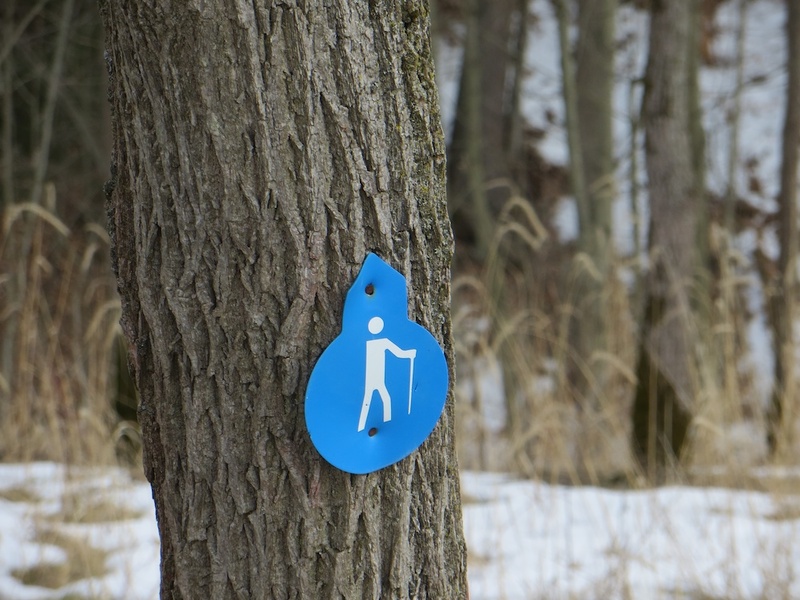 It also would make a decent skiing trail, should you have snow and some cross-country skis. Since I'm undergoing the process of catching up on blog posts, I'm going to make this as short as this hike is! The hike only took about 10 minutes as a loop, less than I had thought, so I walked a bit down into the valley as well. I'll be returning soon to continue the trail through the valley. 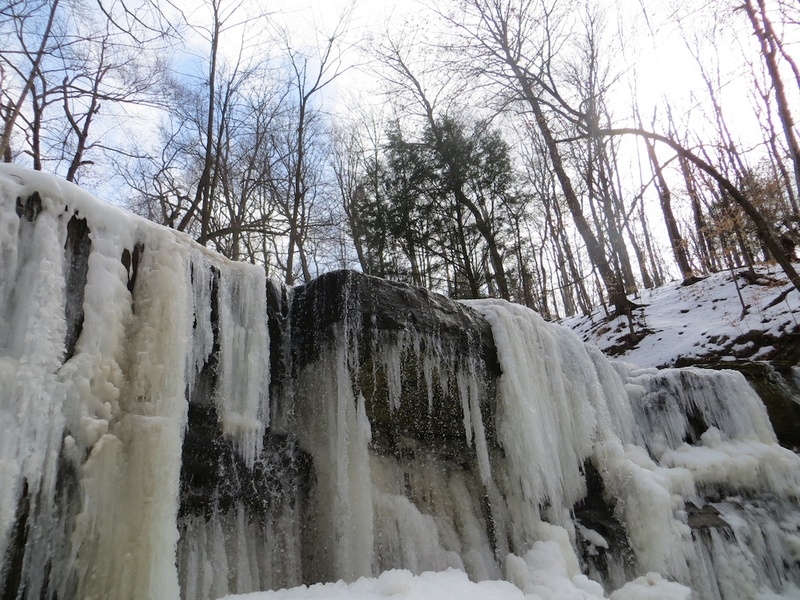 This was a nice short hike along the shore of the Desjardins Canal. Due to the inclement weather I was expecting to instead walk the Desjardins Recreation Trail, a paved trail, though I got sucked in via a paved portion of this trail that then became unpaved, and by then I was hooked. 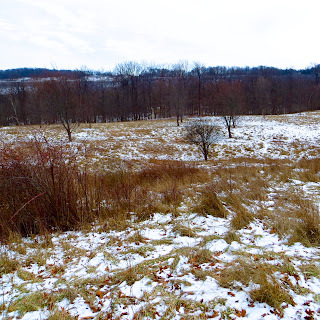 This section of the RBG is one where a tallgrass prairie is being restored, although you almost wouldn't be able to tell by looking. There's no real tall grass yet, but it's in the early stages of restoration. Many signs here educate the onlooker about the work being done here to naturalize the space better. I may have ended up muddier than I expected, but it was a nice walk in any case, and I even got some nice pictures of the melting waters. One of them even made it somehow onto the CBC. 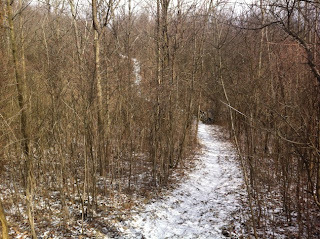 Obscurity: Medium-high -- few know there's a trail in here! This one's a quickie: the car battery died, so while I waited to get a charge, time for my daily hike. I knew of a trail I used to walk when I lived in the neighbourhood, it was almost more of a hike to reach the trail than the trail itself, but still worth it! 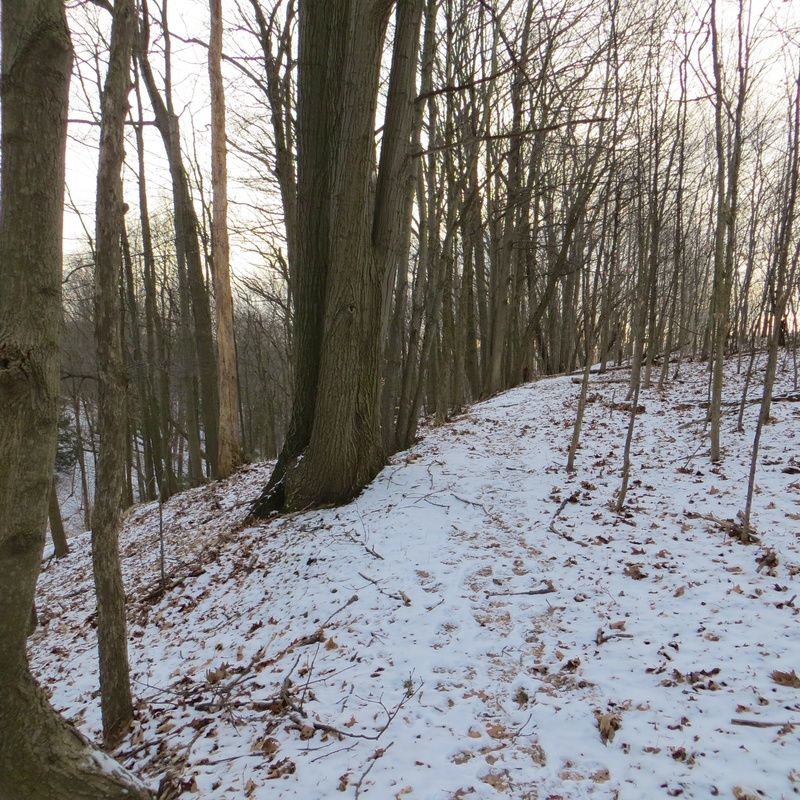 What I'm dubbing as the "Chedoke Woodland Trail" runs from the west end of Glenside Avenue, then into the woods heading south. There's a clearly defined path here that goes on for about a ten minute walk. It's easy, short, and on public land. Easy! This is my first real hike of the year in Burlington, where the RBG's Hendrie Valley runs through. Grindstone Creek runs through here, and right now with the cold-warm-cold-warm phase this winter has gone through twice, there's a lot of ice chunks pushed up and on to the Creek Side Trail! 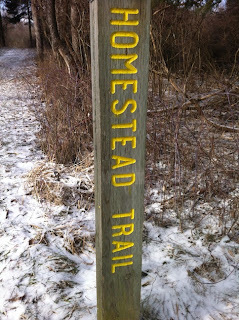 This hike began with a brief section of the multi-use trail in Hidden Valley. I think I save that trail as a whole for another post, when I can do a more thorough walk of it. 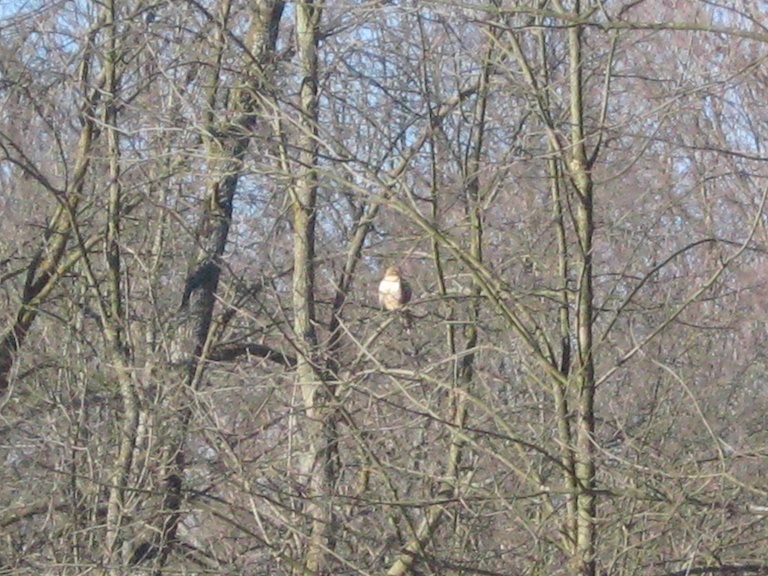 Today's highlight was a rather large hawk, one I later identified (not by photo, but by notes I made after seeing through binoculars) as a Rough-legged Hawk. During the whole time I was walking on the trail section it was scouting, it just sat there, turning its head every few seconds. This is a tricky trail to hike in this kind of winter. 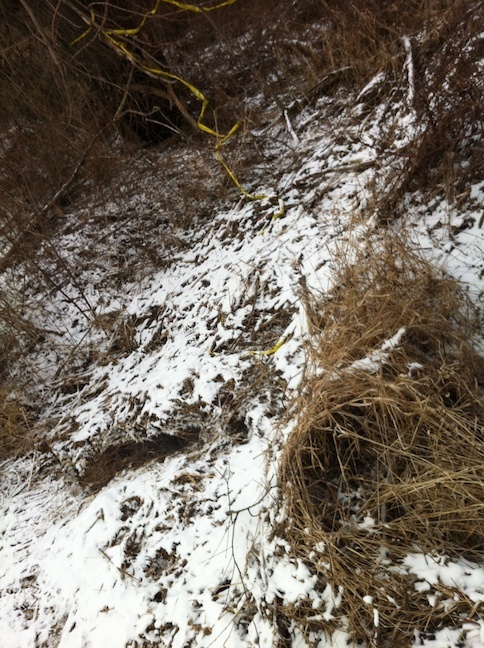 A lot of the trails is very literally creek-side, in that a bit of erosion and it'd be in the creek. 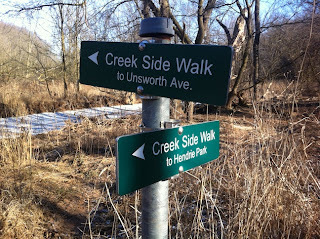 It really needs a bit more of a buffer between the hiker and the creek at many points. This made for a very slippery trail, one that was best to walk beside more than walk on. 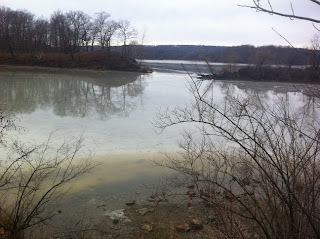 One slip, and you could be in the cold creek! This trail connects up with a larger loop, one I'll be back for soon. 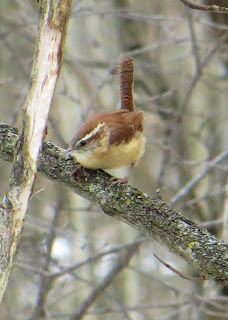 The trails I took today were about an hour, if you account for about ten minutes of me staring at this bird. If I was looking for a good two-hour hike, the loop connected to the end of Creek Side Walk would have been a nice choice. Directions: Heading out of Dundas, take old Highway 8 towards Cambridge, then turn right at Middletown Road. Take Middletown all the way to Concession Road 6W, and park at the intersection. If you like climbing steep trails, you'll love this section of the Lafarge 2000 Trail. I can't imagine how this was ever used as a road. Even with the winding switchbacks, it's a steep hike. You'd have to be in amazing shape to reach the top here and not be at least somewhat winded. Yeah, doesn't look to safe to walk across... wait, what's under the bridge? The creek the bridge crosses. 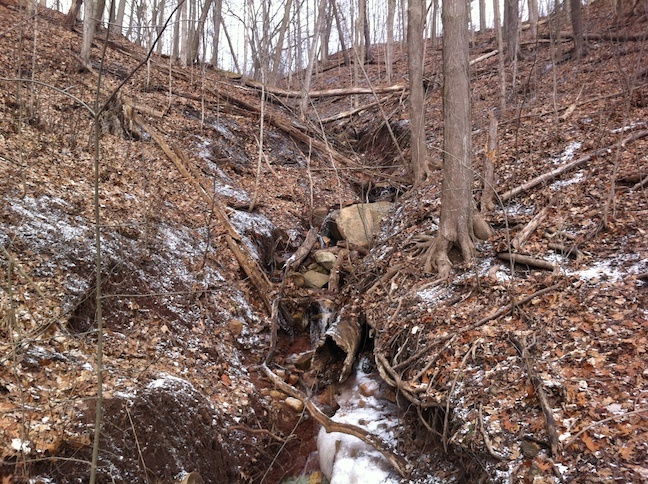 Creek, or a two-inch-wide trickle of water. So, I'm not sure what the HCA was thinking when they announced the trail is closed. If you can walk up the steepest hike in all of Flamborough, you should probably be able to step over a creek that's a wide as about a quarter of an average stride. Maybe, if there was a slight off-chance someone on a scooter could ever possibly get to this part of the trail, I could understand it being closed. Weird! 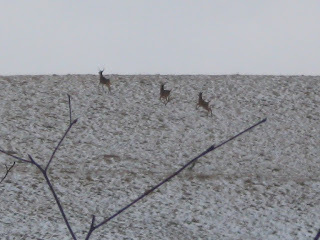 Just as I went to turn back at the half-way point, I saw a full herd of deer running up the next hill. 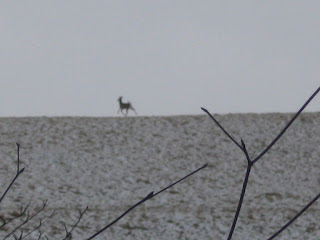 All-in-all it was at least 15 deer that saw me and split off into two groups. 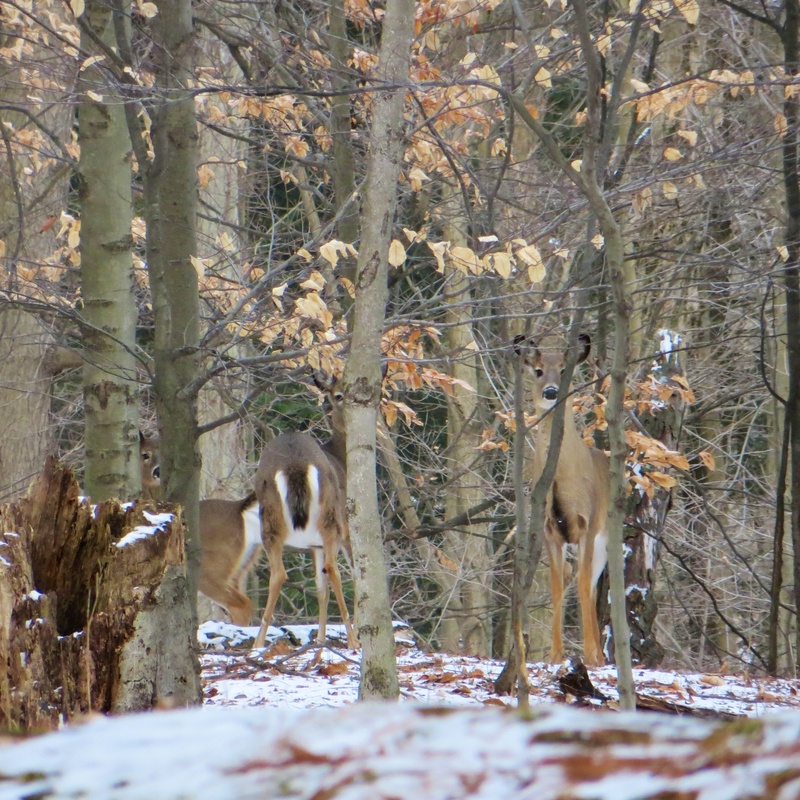 This is certainly the largest single herd of deer I'd ever seen, though I've seen more in separate encounters on a single hike in Dundas Valley before. 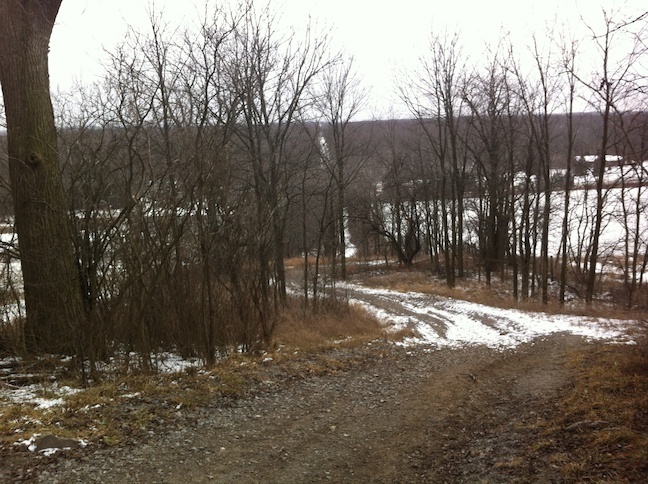 In any case, I've now walked from both ends of this grueling section of the Lafarge 2000 Trail. Someday a full walk from end-to-end and back of this section would be nice as an endurance challenge (3 hills, 2 of them very, very steep would make for a lot of exercise). I’m alive! A very happy Halloween update! Site Content and Photos (c) 2013 Robert Gerald Porter unless otherwise attributed. Picture Window theme. Powered by Blogger.